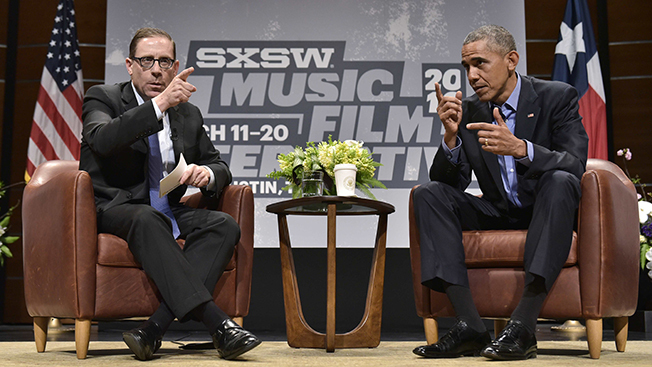 President Barack Obama appeared at South by Southwest Interactive in Austin today and weighed in on the issues that are central to the ongoing fight between Apple and the FBI. The feds want the consumer brand to create a backdoor on its phones for the sake of investigations. Obama, declining to comment directly on the specific case, still managed to acknowledge points from both side of the argument. "My conclusion so far is that you cannot take an absolutist view on this," he said before a packed house at The Long Center's Dell Hall. "All of us value our privacy, and this is a society that is built on a Constitution and Bill of Rights and a healthy skepticism of overreaching power." Obama said he was against the government going "willy nilly" into people's personal data. But he also theorized that if there's probable cause in a terrorism or a child-abduction case, authorities shouldn't be stopped from investigating data that's stored in iPhones, Samsung Galaxies and other mobile devices. Otherwise, one risks "fetishizing our phones above every other value," Obama remarked. In recent weeks, the FBI and Apple have been publicly entangled while the agency's investigators try to gain more data from the phone of Syed Rizwan Farook, who was the main perpetrator when 14 people were killed and 22 more injured on Dec. 2, 2015, in a terrorist attack at the Inland Regional Center in San Bernardino, Calif. Apple has pushed back on the FBI's demands, while notable tech players like Microsoft co-founder Bill Gates have come to Apple's defense. It's been a high-profile standoff. The president suggested that citizens who are 100 percent against the FBI's wishes should look at the bigger picture, pointing to police departments' roadside checks for drunken drivers and airport security after Sept. 11 as privacy breaches Americans have become OK with. "There are some restraints we put in place to ensure we live in a safe and secure society," he added. The Apple-FBI topic, though, was only 10 minutes of the discussion between Obama and Evan Smith, CEO and editor in chief of The Texas Tribune. No. 44 was in town today chiefly to discuss how technologists like those attending SXSW can change American life for the better. "If we use technology, data, social media in order to join forces around problems, then there is no problem we face in this country that is not soluble," Obama said. "The focus isn't just the next big thing. How do we harness the next big thing so every person in this country has opportunity?"